It is Tulip Time in Holland, Michigan. Anytime, is a good time to visit Holland, Mich. where an authentic Dutch windmill grinds stone ground flour, fine-crafted beer is on tap and visitors can see wooden shoes and Dutch-style pottery made from scratch. However, the town is ready for its closeup the first two week of May. 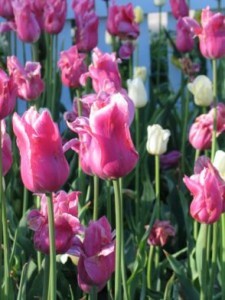 In 2011, its famed Tulip Time festival stretches from May 7 through May 14. Gorgeous yellow and red tulips line the streets, and black, purple, crimson, white and pink tulips fill Windmill Island. Dutch dancing brings crowds to downtown parks and parades are almost every day. Come for a parade May 11 or May 12 but parade lovers will want to stay for the Grand Finale, May 14. To avoid the crowds and more easily snag a hotel and restaurant reservation, go the first week in May because the tulips are already showing off their glorious blooms. The Haworth Inn and Conference Center on the Hope College Campus fills fast because it is within walking distance of the historic downtown and TulipTime activities. Breakfast comes with the room and apples, coffee and tea are always out on a table. Haworth Inn, 225 College Avenue Holland, Mich. 49423 (800-903-9142). The Leed certified, contemporary styled CityFlats Hotel with its popular CityVu Bistro, is also downtown at 61 East 7th Street, Holland, Mich. 49423, (866-609-2489). Holiday Inn Express, Best Western and Hampton Inn are east of downtown Holland near US Highway 31. Click Holland Convention and Visitors Bureau (CVB) for accommodation availability. The city’s CVB website also lists B&Bs, camp sites and other accommodation choices. If interested in events check Tulip Time but don’t worry if they aren’t convenient. The town has many attractions including DeZwann, an authentic, brought-over from Holland windmill, on Windmill Island at7th Street and Lincoln Avenue, (888-535-5792). 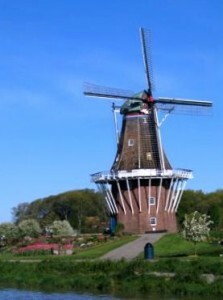 It has the only Dutch Mill Society’s certified miller outside of the Netherlands. Walk Windmill Island’s canals, gardens and shops. Try to catch the Dutch Trade Fair, May 7-8. And browse shops on the town’s historic 8th Street, its main street. 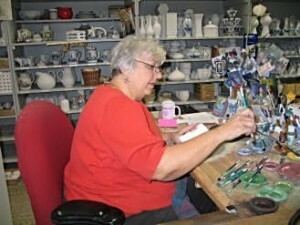 Before leaving, be sure to stop at the DeKlomp Wooden Shoe & Delft Factory east of downtown near the highway. You can watch shoes being carved and talk with artists working on the only authentic Delftware made in the US. Even if staying at an inn that serves a free breakfast, go over to Alpenrose Restaurant at 4 E. 8th Street, (616.393.2111) to ooh at its European ambiance over breakfast or a mid afternoon break. Stop at New Holland Brewing at 66 E. 8th Street, )616-355-6422) for good pizza, sandwiches and beer. Now throw some clothes and the camera into the car and go.